Dubai, 29 January 2018: Dubai Financial Market (DFM) today announced the listing of Bahrain’s Ithmaar Holding B.S.C. (Ithmaar), one of the leading investment institutions in the Kingdom of Bahrain, as trading commenced on the bank’s shares under the trading symbol (ITHMR), which appears on DFM screens, trading system and publications within the Banking Sector. 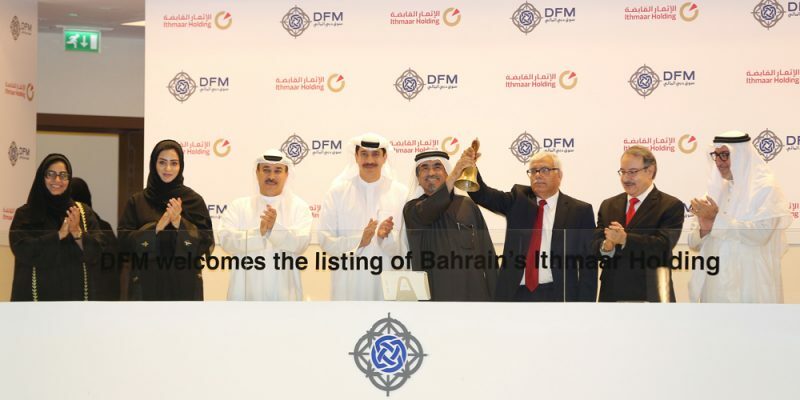 This listing further strengthens the prominent position of DFM as the most favored listing venue for leading local and regional companies and lifts the total number of listed companies to 66. It also lifts number of Dual listings to 16 including five Bahraini companies. Ithmaar Holding Board Member, Abdulelah Ebrahim Al-Qassimi, rang the market-opening bell in the presence of His Excellency Essa Kazim, Chairman of DFM and senior representatives from both sides. Ithmaar Holding Board Member, Abdulelah Ebrahim Al-Qassimi, said: “We are pleased with listing on the DFM, adding a new key market alongside our current listing on the Bahrain Bourse and Boursa Kuwait. The listing is testimony to the important role that Dubai, alongside the Kingdom of Bahrain, plays as a key banking and financial services hub in the region with its reputation for excellence”. Ithmaar Holding owns two wholly-owned subsidiaries: Ithmaar Bank, a Bahrain-based Islamic retail bank, and IB Capital, an investment subsidiary. Ithmaar Bank and IB Capital are both licensed and regulated by the CBB. Ithmaar Bank owns 66.6 percent of Faysal Bank Limited (FBL), a retail banking subsidiary in Pakistan that is listed on the Pakistan Stock Exchange and is mainly engaged in corporate, commercial, retail and consumer banking activities.